Inside the LEO Doghouse: Light My Fire! I will now be so bold as to translate Mr. Springsteen’s words into functional advice for rocket engines. Sitting around and crying or worrying about the world are both passive, energy-draining activities. The only way to start a fire is to add energy, e.g., a spark, to the situation. He’s absolutely right. And I would just bet that you never knew that The Boss was a rocket scientist. In an article about combustion instabilities many months ago, I used the image below to illustrate a situation of limited stability. The ball sitting on top of the hill will sit there forever unless or until something disturbs it. Give it a little bump, i.e., an insertion of energy, and the whole scenario rapidly changes with the ball speeding down the hill. This is also how I think about the process of ignition for typical, non-hypergolic (see previous article) propellants. You can have fuel and oxidizer sitting around, intermixing, but until it gets that bump of an insertion of energy, there is no combustion. No combustion; no high-energy gas production. No high-energy gases; no propulsion. Let’s start from the other end. For a moment, think about a fire in your fireplace. 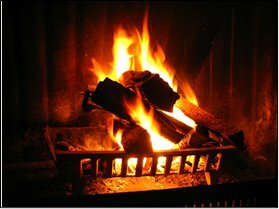 Once you’ve got a good fire up and going as in the picture below, you don’t have to re-start the fire each time that you add a log. The existing fire sustains itself so that the energy produced by the combustion in one moment is sufficient to continue the fire into the next moment using additional fuel (the wood) and oxidizer (from the air). This is generally the case for rocket propellants as well. Once the fire is lit (i.e., once the ball is rolling downhill), the process is self-sustaining. So, the whole issue about making a fire really does come down to the start of the process. How many different ways can you start a fire? One way is to use another fire. Think about the folks running around the countryside with the Olympic torch before the games. They use that torch to light another torch to light another torch, and on and on, all of the way until they light the big torch in the stadium. Another way to start a fire is to use heat. That, effectively, is how I lit a cigar the other evening. I used friction to generate heat to ignite a match. Then, holding the match like an Olympic torch, I used that fire to light the fuel of the cigar tobacco. This model of a cascading series of larger and larger fires is used over and over in different forms. Thus, when we talk about starting a fire, we often have to discuss not only the small initial energy bump, but then also the chain of events leading to the complete, steady state process. So, first we have the initiation, or as The Boss said, “the spark.” Off the top of my head, I can think of four ways that we’ve practically implemented on rocket engine systems to provide that initial energy boost and one other way that, to date, remains somewhat experimental. There may be others, but these are the ones that are most obvious and frequently used in different forms. The first method is exactly what The Boss calls for, an electrical spark. 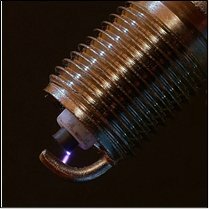 In most cases when lighting liquid propellants directly, the components on rocket engines used to make electrical sparks are not a whole lot different than higher-energy, more robust, and more reliable versions of the spark plugs that you’ve got in your automobile. They use a high-voltage electrical circuit to make a spark jump across a gap thereby exposing whatever is around that gap, namely vaporized propellants, to ionizing electrical energy. The second method also uses electrical energy but in this case rather than making a spark, you use it to make heat. Think about an incandescent light bulb (i.e., the bulbs rapidly becoming old fashioned these days). The intent of the wire filament is to produce light. And it does. But is also produces heat. What if you apply that heat directly to a combustible mixture? Depending upon the mixture, that’s all you need. I’ll explain more below when we talk about the cascade. These first two methods rely on electrical energy and that’s always convenient since wires are easy to run. While it’s true that the ultimate power source can be heavy for the vehicle (batteries for example), the rest of the system is relatively light and easy. The third method for providing that initial energy bump is not quite so clean. Rather than relying on transferring electrical energy into a chemical reaction, it uses a transfer of energy from one chemical reaction to kick off another chemical reaction. In the previous article we discussed hypergolic propellants. These are propellants that combust spontaneously when they come into contact with each other. They don’t need any energy boost to start reacting. Well, what if you had a fluid that did that when it came into contact with your primary fuel or primary oxidizer? You could squirt in some of this spontaneously combusting stuff, light off a small bit of your fuel or oxidizer, and then the energy for that small fire could light off the rest of the propellants. This is a common means for starting kerosene (also called RP-1) engines. The massive F-1 engine used as part of the Saturn V vehicle was lit by a hypergolic ignition system for the main combustion chamber. The most common hypergols for this purpose are triethylborane (a.k.a., triethylboron), triethylaluminum, or some mixture of the two. The fourth and last method that I can think of for supplying that initial energy bump again starts with electricity, but instead of generating a localized spark or heat, you transform the electrical energy into a laser. I will not even begin to pretend that I know much about lasers other than the fact that they can provide a very focused, directed beam of energy, photon energy in this case, to exactly where you want to put it. You can use that energy to make heat for ignition or – and now I’m way beyond my knowledge base – you can tune the wavelength to excite the propellant molecules directly. I have a friend in Germany who has experimented with using lasers for rocket engine ignition. Thus far, I know of no fielded rocket systems where this ignition method is used (although I’ve been told that the Russians have demonstrated it on a full-scale engine), but it offers some very interesting possibilities. So, we’re done, right? After all, you’ve got your spark (or some other energy boost) so you’re lit and ready to go. Well, not always. For the most convenient ignition source, specifically the electrically-flavored ones, our bump in energy, our spark or heat, is usually very localized. Rocket propellants are usually highly energetic and that’s why they’re rocket propellants. But that also means that you have to light the fire well. I struggle with how to explain this in a positive sense, so I’ll explain it in the negative, i.e., tell you what you do not what to do. In your combustion zone, you do not want to ignite just one small space, i.e., one corner, and let the fire spread unevenly. A fire on one side of a combustion zone but not the other could allow unburned propellants to momentarily “pool” in the one region. This could lead to detonation and/or conflagration pressure waves bouncing around your chamber until everything evens out. That can be extremely dangerous to the point of tearing apart the engine. Or maybe, because of these pooled, unburnt propellants, you get mixture ratios that cause hot streaks. Most practical combustion chambers are not built to accommodate stoichiometric or oxidizer-rich combustion (unless it is specifically an ox-rich preburner where it is should be very ox-rich to avoid this same issue). A localized phenomenon of a slight ox-rich ignition could burn a hole right through a combustion chamber wall. Or, if you’re talking about a gas generator or a preburner, you could get hot streaks that damage turbine components. I have seen the kind of damage that can be done in a turbine due to ox-rich hot streaks for just fractions of a second. Ideally, what you want is for your propellants to arrive and, blammo, everything it lit. That “blammo” can be difficult to achieve with a localized energy into like a spark or a small electrical heat source, especially for larger engines. To overcome this issue, we turn back to the simple analogy of the fireplace. There, we go from the localized effect of the match, to perhaps a ball or two of crumpled newspaper, to shavings or kindling, to larger sticks, to eventually the logs. So there is a cascade of events from small and localized to large and generalized. I will give you two examples of how we apply this concept in rocket engines. The J-2X gas generator has a pyrotechnic ignition system. It’s quite easy to tell people that we ignite the GG with little, solid propellant charges. Okay, but is that the whole story? No, it’s not. The solid propellant charge (think about little Estes® rocket motors) is just the fire-lighting-the-fire end of the process. It all starts with electrical current running through an igniter wire. The electrical resistance of the igniter wire causes heat as the current passes through. That heat is enough energy to push what’s called the “pryogen” into ignition. You can think of the pryogen as being like the stuff on the head of a match. Other flammable substances are often used but the idea is still the same. That little fire in the initiator ignites the solid propellant and the solid propellant then shoots hot gases into the GG during the engine start sequence to ignite the hydrogen and oxygen just as they arrive. Pyrotechnic igniters like this are highly reliable. If that electrical current arrives, everything beyond that is pure chemical chain reaction that produces a powerful blast of ignition energy. On the negative side, such an igniter can only be used once. I guess that you could inspect and refurbish elements of the piece, but considering the trauma of the process it experiences, it is easier and cheaper to simply replace the whole thing. Another example of the concept of using an ignition cascade can be found on the J-2X in the form of the torch igniter used for the main injector. Here’s an interesting little piece of history (as it’s been told to me). The J-2 engine, back in the 1960’s was a pioneering effort. While the RL10 was already flying, the use of hydrogen as a propellant was still something relatively novel. For the J-2 main injector they developed a torch igniter system. That system was later adopted and modified slightly for use as the ignition system for the Space Shuttle Main Engine main injector and both preburner injectors. When we came to the development of J-2X, we started with our many years of successful experience with the SSME torch ignition system, made some modifications and, through a dedicated test program at the igniter level, effectively revalidated and expanded upon the pioneering efforts of the 1960’s. It’s good to be part of another small step in that long and successful history. The torch igniter concept starts with an electrical spark from what really looks like your ordinary automobile spark plug. But such a spark is very small, very localized. So what you do is swirl into that localized area just a little hydrogen and oxygen. This is the kindling. The electrical potential across the gap of the spark plug causes the gasified propellants to ionize and become very hot, hot enough to start to spread the fire and, from that, thereby creating a flame front. That flame is then directed into the combustion zone just as the rest of the propellants are reaching the injector. The whole igniter system is effectively a torch ejecting a flame into the combustion zone. In the J-2X (and in the SSME and in the J-2), the torch is right in the center of the injector face. Okay, so there you have it, in two articles, how to get a liquid rocket engine up and going. First, you have to get the propellants moving to the right places and, second, once they’re there, you’ve got to light the fire. For large rocket engines, the whole process from the receipt of the start command from the vehicle until the engine is functioning at full power level takes anywhere from about three to six seconds. During that time, pumps have to start spinning, valves have to open, propellants have to reach their destinations in the correct proportions, and the ignition source has to try to light the fire not too early and not too late. It really is quite an orchestration of events across a brief period of time. And the more complex the engine, the more difficult it is to get the orchestration right. Great articles. Very informative – thank you for writing and sharing them. Can you write about how rocket stages are joined together? I have been seeking an answer for this question ever since Apollo-Saturn V days. Now with SLS, my burning question of over 40+ years seeks an answer. I know the stages are stacked in the VAB, but how do they join them physically together? I know it haste be some kind of mechanical joining of literally nuts and bolts but how do they “tighten” them when the stages are joined? There also has to be the pyrotechnics installed so that the stages can “stage”. How do they do that when the stages are stacked. I sure hope you get this and can provide an answer…..been seeking one for a long, long time! Hey Bill, I knew you’d talk about the different igniters, I knew you’d mention RUD as a problem in case of anisotropic ignition… and yet I read the entire post 😛 Your entries are like finger foods! 😀 Keep ’em coming! 1) The pressures of the fuel/oxidiser entering the combustion chamber have to be greater than the combustion chamber pressure… else the fluids would be backed up, and wouldn’t flow into the chamber. 2) If that’s true, and it’s also true that the pressure in the engine is the highest at the combustion chamber (proceeding to taper out in the nozzle from then on) — where does the need for combustion itself arise? 3) i.e. the dynamic pressure (of the fuel/ox) is provided by the pump — which accelerates the mass of fluid propellants — through the injectors. Thus, If you accelerate these fuel/ox streams such that their magnitude of acceleration is >1g towards the ground (as measured in the ground-reference frame), then that should provide thrust. 4) If combustion won’t increase the pressure beyond the static+dynamic pressures that the fuel/ox is already at, then why bother with burning? Of course, I know this is preposterous. I know combustion greatly increases the pressure of the exhaust gas — i.e. accelerating the mass ‘backward’ and eventually (through Newton’s third law) the rocket forward. But where I’m stuck is – how does this pressure communicate with the rocket structure? I’m stuck… unless the second part of the statement in 2 doesn’t hold. i.e. Combustion chamber pressure (measured say, only millimetres downstream of the injectors) is NOT the zone of highest chamber pressure. The chamber pressure peaks further downstream of this zone, and “pushes” against the nozzle. The reason this pressure doesn’t travel back up to the vicinity of the injectors is because of the velocity of the medium in which the pressure waves would have to travel, exceed the velocity of the pressure waves. i.e. the flow’s supersonic with respect to the speed of sound in the fuel-ox mixture. Have I completely lost it, or am I making some semblance of sense? I wish I could boost my sprinter van performance with a rocket engine like this! This is a really insightful article and I enjoyed how you simplified complex rocket science by using everyday analogies that were easy to digest and apply to the ‘big picture’! Really enjoyed reading this good piece of wholesome writing. Thanks for this interesting topic. Can you clarify an issue with the J-2 method of ignition? @greg: The joining and separation of stages is not something with which I’ve been personally involved. My technical background has focused mostly on the fluids side of the house as opposed to the structural design side. However, I’ll do some research by asking SLS Stages folks (three floors above me in this building) and see what I can find out. @AJA: What combustion offers is not pressure. Think about pouring some gasoline into a bucket and dropping in a match. The pressure is the same pressure as everything else in this case, i.e., atmospheric. But what you get is heat. Heat is energy. What combustion offers is a convenient boost in energy to your working fluid. However, you are absolutely correct: You do not need combustion to have a rocket. A balloon expelling your breath as it flies across the room is a perfectly valid form of rocket. Thus, you could do the same thing of just expelling gas with a more effective propulsive fluid like, for example, hydrogen. And, if you really wanted to get fancy, you could do something to heat the hydrogen on its way out to make it more energetic and travel faster. That, right there, as a simple description of a nuclear-thermal rocket engine. There’s no combustion involved. Instead, the heat comes from a nuclear reactor. The hydrogen is pushed through a reactor, picks up lots and lots of heat, and then gets expelled through a nozzle. And the specific impulse performance of such a rocket can be twice that of any hydrogen/oxygen rocket. Go back and locate the archived article where I derive the rocket equation (21 March 2011). That will give you a good explanation for how rocket propulsion works on a theoretical level. From there, you can translate that back to practical manifestations. You haven’t “lost it.” Really. Sometimes you just need to take a step back. @Mark: Very good question. What failed in this case was a line that fed the augmented spark igniter (ASI, i.e., the torch assembly used to ignite the main injector). Operationally, it is quite common to continue to flow propellants down the torch tube even after ignition has been achieved. This maintains positive pressure in the tube to avoid any recirculation zones. Depending on the engine configuration, you flow either both propellants or just fuel to keep it cool and pressurized. In this particular failure, there were flow-induced vibrations violent enough to rupture the line that feeds the ASI. The torch enters the chamber for the J-2 similar to the picture in the article with the tube in the middle of the faceplate. However, the lines feeding it have to snake up from somewhere just downstream of the pump discharge. I’m not sure where in that line the failure actually occurred – closer to the tap off or closer to the ASI assembly – or when in mission profile the failure occurred. From the video, they make it sound as if it may have been during the start sequence, but as I’ve said, because the line continues to flow, it could have been later. Thus, the failure could have been an ignition failure early in the engine firing or it could have been a depressurization later in the firing due to the busted line acting like a hole in the combustion pressure vessel. Either way, the simple Apollo control system registered a low chamber pressure on the engine and, from there, took action. It is interesting to note that this failure you cite is a very famous failure here at NASA MSFC. Based upon needing to avoid such failures in the future, the engineers here have developed extensive analytical models, design criteria, and qualification testing processes to address flow-induced vibrations in convoluted metal bellows. Because we are dealing with cryogens and because we are often dealing with engines that gimbal, our rockets almost always need lines that can flex and/or dimensionally change to accommodate thermal stresses. Learning how to design and use these fundamental pieces of hardware safely is yet another requisite building block for making rocket propulsion successful. Is the J2X engine designed to start and restart in space? @Steve: The J-2X is designed to start at altitude (over approximately 200,000 ft) and, as currently configured, restart once in space. That mission profile is similar to the J-2 that was used on the Saturn IVB stage during the Apollo Program. It is conceptually possible that the J-2X could be reconfigured for additional in-space restarts, but the need for that has not yet been identified. I recently read your last November article regarding J2X test and there is something I want to know. According to the picture of test stand A1 and A2, each J2X engines was installed with different angle. Could you explain the reasons and advantages for each of them? @Jack: Excellent question! Back when I was a very young engineer and just starting work out here, I made a trip to the Stennis Space Center, saw test stands A1 and A2 – both of which contained SSMEs at the time – and asked that same question. I was told that the engine was angled in A2 such that it properly simulated the angle of the engines as they sat when mounted in the Space Shuttle orbiter for launch. I was told that that was important since it simulated the high spots and low spots in the lines and therefore represented as close of a simulation as possible to launch conditions. I blissfully accepted this answer and went along my merry way. However, it wasn’t too long after that, as I was looking through the engine-to-orbiter interface control document (ICD) that I noticed that each engine mounted on the Space Shuttle was rotated relative to each other. Well, if that was the case, then a single angle and single rotation of the engine on the test stand couldn’t possibly simulate all three engines. And so, when I asked anew, I was told that, no, the stand was only meant to simulate one of the three. Well, okay, that didn’t make quite as much sense, but it seemed logical enough to be plausible and it didn’t really impact anything I was doing at the time, so I just accepted it. It wasn’t until I eventually got to the J-2X program and we started talking about various testing options – including, at one time, building a secondary test position on stand A1 (an idea that evolved into what became stand A3) – that I finally learned the truth. The engine test position on stand A2 is angled so that they could fit the diffuser into the stand without wholesale modification of the flame bucket. Remember, these stands were not originally built for SSME testing. They were built to test the Apollo Program S-II stage. It wasn’t until the 1970’s that they were modified into being single-engine test facilities. So, they added propellant tanks and feedlines and thrust take-out structures, etc., and on A2 they installed the passive diffuser so that low power level testing on SSME would be possible. They fit the diffuser in, and properly redirected the engine exhaust, by putting the engine at an angle. Ta-da! The lesson of this story, for me, was that seemingly logical and plausible stories can indeed be just that, stories, even if they kinda sorta make sense at first. I came across your blog recently and have thoroughly enjoyed it. Found out more about stuff that I thought I knew. Anyway, how do I go about getting your permission to use some of the figures you have for a book I am writing? Please e-mail me so we can discuss further. Thanks. @Organic Marble: Yes, that is actually a picture of an old SSME injector. You cannot see the whole thing because the picture is taken up through the main combustion chamber throat. However, you can see baffle elements in that picture. On the main injector of the SSME, the baffles were formed by extended injector elements, not more solid ridges like you’d find on the old F-1. These extended elements on the SSME were active but with altered mixture ratio and additional cooling. In the picture, the baffle elements appear “more silver” (it seems to me), form a ring around the center, and have spokes extending outwards beyond our field of view. Previous Previous post: Inside the LEO Doghouse: Start Me Up!